Who doesn’t love brunch? That in-between stage of breakfast and lunch, were you can get the best of both worlds. Perfect for a lazy Sunday or a mid-week catch up with the gang. 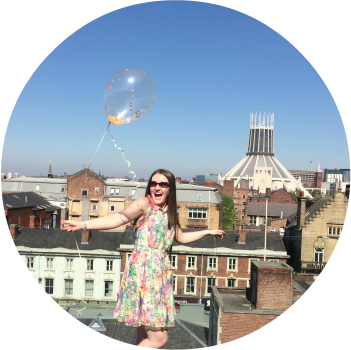 A couple of weeks ago, with the fridge bare, a slightly later start to the day and our stomachs grumbling, the Mr and I decided to take advantage of our city centre location and pop around the corner to Carluccios for brunch. Carluccios prides itself on serving up authentic Italian cuisine at affordable prices. The happy, bustling atmosphere has that traditional Italian family feel, the perfect place for larger gatherings. The restaurant itself is off the back of a small shop which that sells traditional Italian wares, infused oils, Italian breads and cakes, many of which you’ll find on the restaurants menu too! Great when you have something you really like and would love to recreate at home! We took a table near the back next to the long bank of windows, looking out onto the shoppers going through Liverpools Metquarter shopping centre. The great view of MAC had me itching to go in and swatch, but first things first, food. The breakfast menu is the perfect brunch menu, with offerings of Italian breads, hams, cheeses and eggs of many shapes and sizes, it was like being on holiday abroad, minus the sunburn. I opted for the eggs royale; free ranged poached eggs, smoked salmon, toasted italian bread, all covered in lashings of hollandaise sauce. 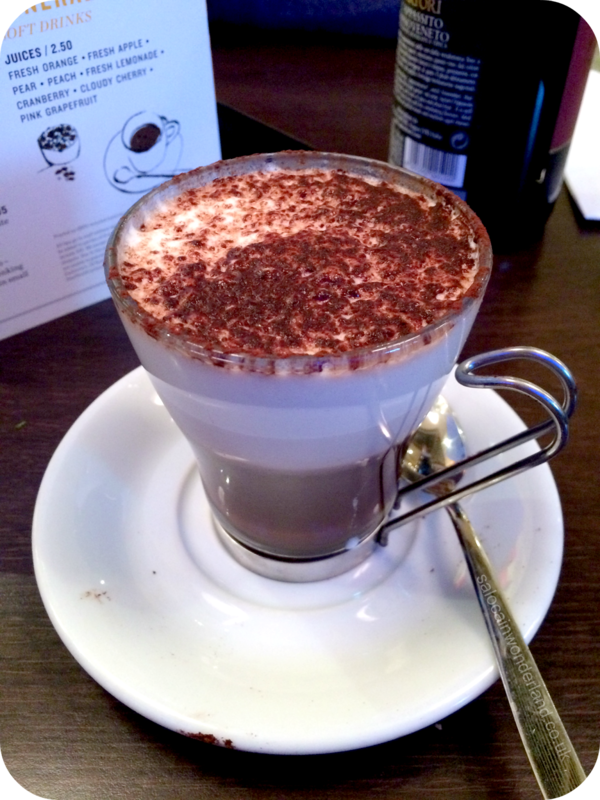 I also picked a Italian hot chocolate, I’ve never had one and wanted to know what the difference was! Mr went for a classic Eggs Benedict; free ranged poached eggs, Italian smoked ham, all on toasted Italian bread and covered in hollandaise. Great minds think alike, eh? Carluccios wasn’t too busy when we sat down around 11am, but as soon as we ordered more and more early morning shoppers appeared in need of filling their boots after emptying their purses. Our drinks came and I was eager to try my Italian hot chocolate. Turns out, it might not have been the best choice for breakfast. I have a mega sweet tooth but I wasn’t expecting it to be just so rich! It was like drinking dessert - no complaints from me, it was so creamy and rich, but on an empty stomach, probably not the best idea! Our food came out piping hot and well presented. The portion size was bigger than I expected too! The salmon was the first thing to hit me, it had such a strong, smoked, scent, I just knew it was going to be good - it wasn’t, it was great. There was so much salmon on there, and thickly sliced too. My eggs where perfectly poached and with a little pressure popped and oozed out all over the salmon and bread - hey, stop drooling on my blog post! 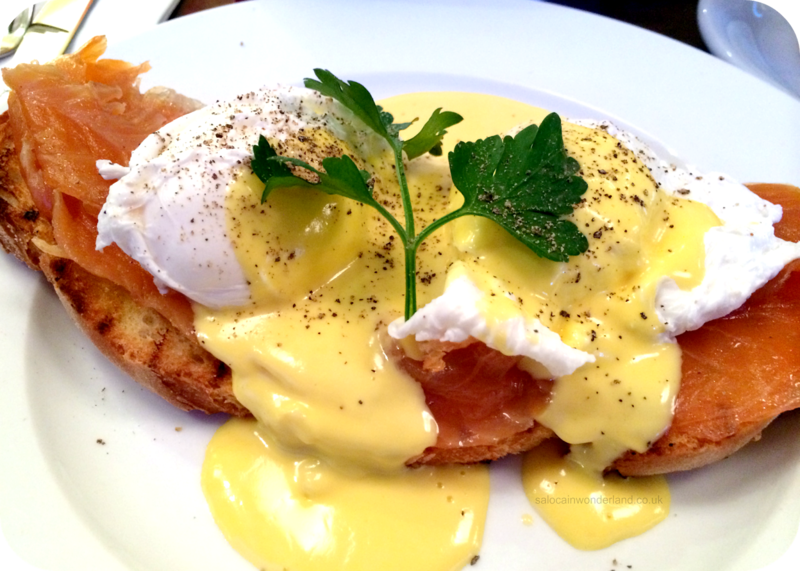 The hollandaise was really buttery and smooth, lightly peppered and delicious, you really can’t beat hollandaise and salmon. Damn, I’m making myself hungry now! Mr throughly enjoyed his eggs benedict, his eggs were just as well cooked as mine which scored uber brownie points but he wasn’t overly impressed with the smoked ham, he enjoyed it but said it didn’t exactly rock his world. You win some, you lose some. He did enjoy their coffee though. Would I go back? Yes, I really want to try their lunch/evening menu and they have some great set menu offers. I also need to go back and see if they sell their hot chocolate mix in the shop! 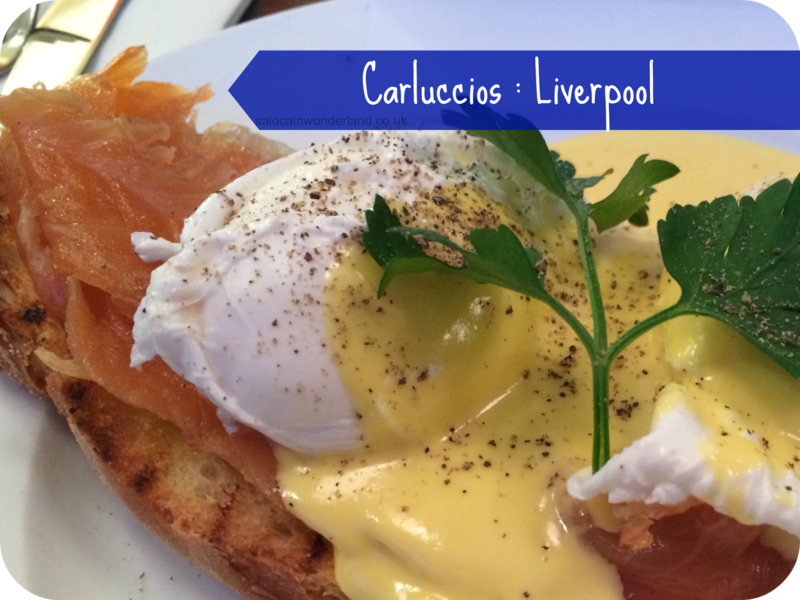 Have you tried Carluccios? Let me know in the comments below! Oo make sure you do and let me know what you get! The salmon was just perfect, I'm tempted to go back JUST for that alone! I love eggs I love eggs. Poached perfectly is the best. Poached are my favourite, though I still fail at cooking them myself!